Rarely, and I mean, RARELY do I ever come across a Hot Wheels release that I have never seen before. So when I saw one of these pop up for sale this week, I jumped all over the sale. Being a collector for 20 years now, I realize this was done hastily, but normally when something that I have not seen before pops up, it is normally pretty rare so for less than $20-shipped, this seemed like a no-brainer. After buying, I checked and there were a few listed on ebay but they were all priced in the $40-$60 range. Then I checked the “completed listings” to see what these were truly selling for. Unfortunately, I only found 1 listing and that had sold for $12.50-shipped. So maybe I overpaid a little bit but when you like something and its not all that common, sometimes its best to spend a little more to grab it now before its gone and you lost your shot at it. So not knowing much about the Hot Wheels Racing Select line as well as this casting, I decided to do some research. My two favorite databases are South Texas Diecast and the Hot Wheels Wiki–which I had a hand in building. I checked out the base of the car since the name of the casting is no where on the packaging, its reads “1981 REGAL”. I could not find the casting on South Texas Diecast, which is pretty rare since its probably the most comprehensive database there is. I searched the Hot Wheels Wiki which has a little bit better of a search feature. There was no casting page for the ’81 Buick Regal Stocker but the release was listed under the 2001 Pro Racing section with no picture (at the time). I have since added the “loose” photo below (the one with the hood closed) . So now we have this beautiful stocker in the Hot Wheels Wiki database. While I don’t know much about the Hot Wheels Racing Select line, I do know that is was discontinued in 2001 so only a few castings are out there. As far as I can tell, this ’81 Buick Regal Stocker was never released again. 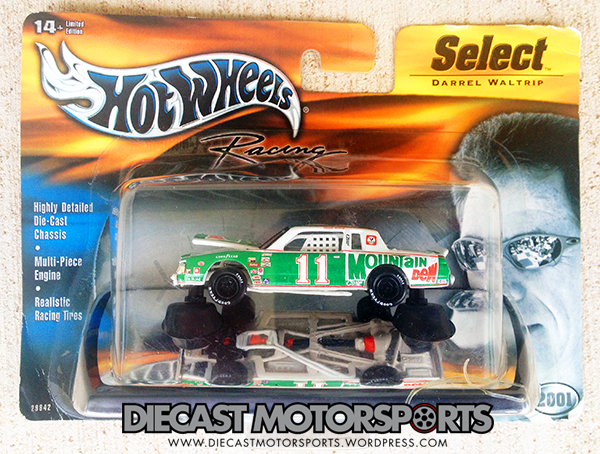 The #11 Mountain Dew paint scheme of this release is an authentic NASCAR paint scheme that Darrel Waltrip drove in the 1983 season and one that had previously been released in the 1983 Hot Ones — the casting that wore it, an unlicensed vehicle named, “Racing Stocker” which was apparently modeled after the real ’81 Buick Regal Stocker. RELEASE DETAILS: White Enamel Body (metal) with #11 Mountain Dew paint scheme. Clear Windows. White Interior. Black “unknown” Real Rider Wheels with Goodyear Eagle tampos. Light Gray Base (metal & plastic elements). Made in China. Toy# 29842. Released in 2001 in the Hot Wheels Racing Select line. UPDATED 09/12/2016 — New Pictures added with OTD watermark, including one with the stocker’s hood in the open position. Best one to date so far.